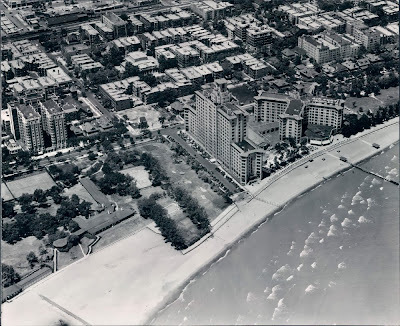 Aerial shot of Edgewater Beach, 1936 Reviewed by Edgeville Buzz on January 26, 2011 . Obviously many of the buildings and single family homes in this photo have long since been replaced, though a good number of them are intact. Does anyone know what the large white building is on the west side of Kenmore, directly west of the Edgewater Beach Hotel? It looks to be a Temple or something similar. Note the interesting directive sign on the roof of the north wing of the hotel itself. I’m also curious what used exist at the current site of the Jewel Osco store at Broadway and Berwyn. It’s hard to tell from this angle.